"The Very Best Paranormal Conference Of The Year""The Very Best Paranormal Conference Of The Year"
"The Very Best Paranormal Conference Of The Year"
"Real Ghost Hunters Go To The Extreme Paranormal Conferences In The World!" “Ghost hunting” is one of the fastest growing fields of study in the world today. Families are taking haunted vacations and historic ghost tours in cities around the world, and individuals who are interested in the paranormal are coming together to investigate reported ghostly activity using both scientific and esoteric means. People are talking about ghosts and many want to learn more and see the phenomenon for themselves. So what better way to experience and learn more then by going to one of the best Ghost Conferences in the world. Many "Paranormal Conferences" boast to being "The Best", "The Biggest" "The Most Haunted Place You Could Ever Be". The play hosts to guest and celebrity as well as people well worth investigating. Paranormal conferences today seem to be a new growing trend. You can learn just by paying a small fee the latest paranormal tech talk, exposure to others new deep secret evidence that we are truly haunted by real ghosts. As a person in the paranormal community I personally attend many conferences, conventions, workshops, seminars and lectures that deal with the world of the paranormal. From UFO, Crytids and Bigfoot to anything and everything that deals with ghosts and strange paranormal phenomena around the world. You can learn many things at a paranormal convention, seminar, group meeting or major convention. Each year the attendances of such is growing in numbers. Not merely of people who just hunt for ghosts. People from all walks of life have interest in Ghost Hunting and Paranormal exploration. Many liken paranormal mania as a religion un to itself. 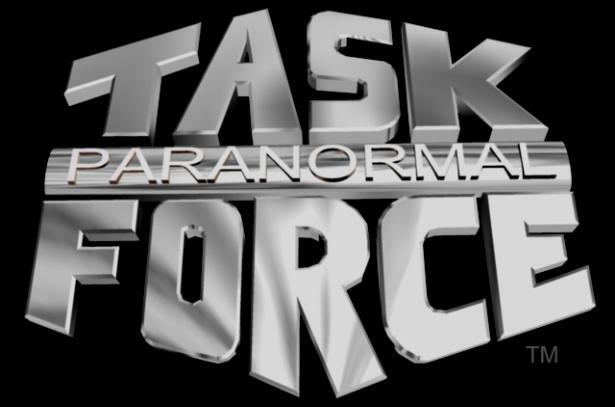 Each year Paranormal writer and investigator Troy Taylor plays hosts to all the ghost hunters from around the country. His Conference boast many special well known guests as well as special attendees that many of you know or recognize in the field today. Many call it the real ghost hunters convention. At Taylor's Paranormal Soiree you really will learn allot. Several guest speakers that really know their stuff as well as breaking panel sessions and meet and greats. This is as many say the most exciting well respected members of the communities number one for the must attend Paranormal Conference of the year. Please see: REAL GHOST HUNTING: AGS Lucky 13 Conference Real Séance photos 2009 and REAL GHOST HUNTING: Photos from AMERICAN GHOST SOCIETY (AGS) 13th Annual Conference (Decatur, IL). 2. The ScareFest Horror and Paranormal Convention in Lexington, KY ~ The Largest Horror and Paranormal Convention In The USA. This is the Fan fest of paranormal and horror. A grand mixture of the real and the unreal. You might find yourself enjoying a great horror movie conversation or talking ghosts with the great Patti Starr herself. This is becoming one of the most fun filled and informative events to attend. 2. Spookalooza! Join Host Troy Taylor, Illusionist James L. Clark & Medium Ken Berg for the Biggest and Most Chilling Halloween Event of 2009! You'll be riveted to your seat at one of the most terrifying events of the season as we hold our final Houdini séance within the haunted confines of the legendary Lincoln Theater! Be chilled by a theatrical re-creation of a Victorian séance, which will have you wondering if it's real, or merely an illusion! Be unsettled by a Live Radio Show from a 1936 Houdini Séance and then pushed over the edge as a real-life spirit communication begins to try and reason the spirit of famed magician Harry Houdini! He always maintained that if it was possible to make contact from the other side, he would do so -- and will be finally make contact at the Lincoln Theater on the 83rd anniversary of his death? 4. Ghostock is a paranormal enthusiast's convention hosted by Patrick Burns of Tru TV and Court TVs investigative series "Haunting Evidence". Anything that Patrick Burns hosts you know is the real deal. 5. Dublin Paranormal Convention The 2nd Dublin Paranormal Convention will take place on Saturday the 7th November 2009 in Radisson SAS Royal Hotel, Dublin near St. Patrick's Cathedral. Following on from last year the DPCC plan on making this bigger and better while holding on to the fantastic atmosphere which made ParaCon 2008 such a success. LATEST NEWS: We can confirm that this year we will be joined by returning guests Richard Jones and Steven Parsons. New for this year is Ciaran O'Keeffe of Most Haunted plus Barry FitzGerald of Ghost Hunters International. 6. UNIV-CON Is one of the most cutting edge conventions to attend. This is the national paranomal convention of the year! Many, Many special guest speakers, And the time spent attending is a learning experience from the second you walk in. UNIV-CON is always coming up with new, innovative and diverse events. Because of this, our schedule of events may change. Be sure to check back often to keep up to date with the current schedule. A final schedule will be available one week before the actual event begins. 7. Roswell UFO Festival Where better to host the biggest and best UFO convention in the world. This is one of the best most fun and exciting UFO conventions you could ever attend. Great special guest speakers, seminars, workshops, lectures Roswell has it all! 8. Chicago Ghost Conference Ursula Bielski (Chicago author and lecturer, 20-year veteran paranormal investigator, and founder of Chicago Hauntings Tours) and Michael McDowell (acclaimed investigation instructor, journalist, and founder of the Indiana/Chicago Ghost Trackers, one of the largest ghost hunting organizations in the world). 9. Para-CON is not about being the largest Paranormal event in the country, it is about educating the public to the culture of paranormal. We have brought together many educated and beautiful speakers, artists, performers, models, etc to reveal to the world that paranormal is diversity. Para-CON is about celebrating and understanding the many cultures it crosses. 10. Texas Bigfoot Conference Some people think that the bigfoot phenomenon is limited strictly to the Pacific Northwest; they would be sadly mistaken. There is a common misconception of Texas terrain as being nothing but prairies and deserts, with a lone tumbleweed rolling by. It is probably safe to assume that many people who have never been to Texas, formed their opinion from watching the television show Dallas in the 1980s. In East Texas, which is where the majority of the reported sightings of bigfoot occur in the state, there are approximately 12 million acres of forest land. This Convention is heralded by many as the best in land and worth every minute of the time spent there. Michigan ghost convention Oct 17th & 18th 2008. August 14-16th, 2009 in Dayton, Ohio. Canadian-American ghost conference in Sarnia, CA, August 6-7th. May 30th 2009 all day. Louisiana's first ghost and paranormal conference February 28th, 2009! Mt. Hood, Oregon April 25-26th, 2009. Ghost conference is set for October 17th, 2009. May 30th in Dayton, Ohio. Some conferences though hold allot of anomalous things going on other then just ghosts. Such as the ill fated TAPSCON 2009. Many of us in the field have gotten emails concerning this and Brent Fair. The controversy as many know is far from over and it certainly puts those involved in a bad light amongst ghost hunters fans. Some additional information has come out about TAPScon2. Other Great Paranormal Convention, Conferences, Workshops, Seminars and Lectures For you To Attend! Come spend the evening and part of the night in Hillsboro, Missouri with Greg Myers and Paranormal Task Force for a night of educational and investigative ghost hunting fun! The historic and haunted locations of the Fletcher House Foundation along with the experience and knowledge of the ghost hunters from Paranormal Task Force featured in paranormal documentaries "Children of the Grave", "The Other Side" and soon to be released 'The Haunted Boy" will bring you a night that you will truly remember! Learn about Hauntings, Ghost and other things that go "Bump in the night". See hands on demonstrations of basic ghost hunting equipment, learn investigative techniques and how to hunt ghost yourself. Hear the eerie and true tales about the locations then accompany the ghost hunters on an actual interactive ghost hunting tour and even possibly have a paranormal encounter of your own! Dates of Workshops: Saturday July 18, 2009 starting at 6:00 p.m. Cost: $35 donation per person. Where: Workshop will be held at the Hillsboro Presbyterian Church located at 10790 Highway 21, Hillsboro Missouri 63050 followed by the interactive ghost hunting tour of the Historic Governor Thomas Fletcher Home, Huskey Cabin and other possible locations. 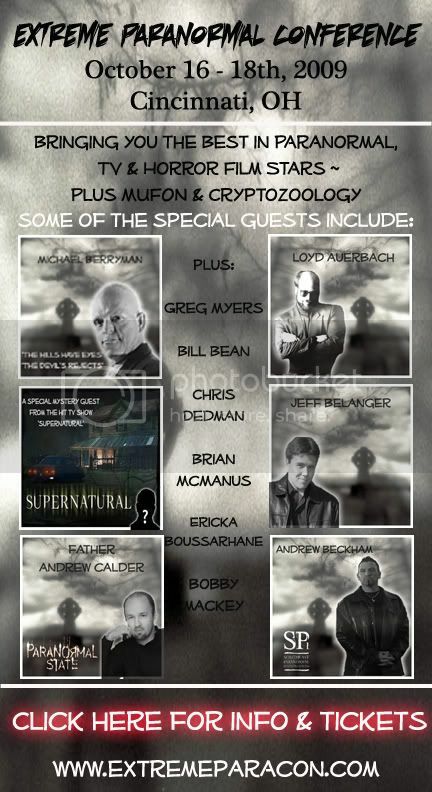 2009 extreme paranormal conference is being held in cincinnati, ohio on October 16th, 17th & 18th, 2009 ~ bringing together the best in paranormal personalities, horror movie & tv stars for one weekend of fun, thrills, lectures & a supernatural VIP dinner! Historic Ghost Hunter Cruise on the Jewel of the Seas, October 17 – October 22!. ghost tours of the local towns, lighthouses, graveyards, etc., are available for the those looking for more ghostly adventures(available only to the group sailing with Mark)! While onboard, prepare to be thrilled and chilled during presentations and demonstrations, as Mark takes you through some of his many encounters and experiences. You will also have the chance to learn how ghost hunting equipment is used... and try it yourself. For those interested in the Civil War, this cruise will nalso offer you the opportunity to talk with Mark about his years of research, his books, philosophies... and why he thinks some of those who were there, still walk among us! Hotel on October 22. Experience a guided Trolley Tour of the historic haunts of Boston, with its legends of Lizzy Borden and the Boston Strangler. MEET PARA-CELEBS THAT ARE TOPS IN THE FIELD! Minnesota's own Brian Leffler and Joel Sturgis, The top paranormal specialists in the state of Minnesota, and the voices of the Dark Plains Radio Show! Spooks R Us Radio Show - the official voice of the event! Click on the shirt image below!! Official kick-off with the Italian dinner with the paranormal celebrities (Gold and Silver V.I.P. only). This event will be approximately 2 hours in length and will include a screening of Ontology TV. This episode of Ontology was filmed at the Eveleth Recreation Building where the main investigation for this event is taking place. This is your chance to screen the location and see some of the fantastic evidence collected at this wonderful location! This will be the official start time of the meet and greet! This event is open to all Gold V.I.P., Silver V.I.P. and General Admission Gold ticket holders. This will be a chance for you to meet and talk with your favorite paranormal celebrity! We will also be including some great music provided by a couple of great local bands. There will be a bar that will have your favorite beverage! We will launch the beginning of the speakers and the vendor tables at this time. This event is open to all Gold V.I.P., Silver V.I.P., General Admission Gold and General Admission Silver ticket holders. It will include a full day of buying and selling at the vendor tables as well as listening to all of your favorite speakers entertain everyone with some really great stories, learning experiences and stories. We will be staggering the speakers with enough time in between for everyone to stretch their legs, get something to eat and mill about. This part of the event will run until about 6:00 pm when we take a break until supper time! This is the time that we will be heading over to the Eveleth Recreation Building for our all night investigation. This event is open to all Gold V.I.P., Silver V.I.P., General Admission Gold, General Admission Silver and Investigation ticket holders. The Eveleth Recreation Building is one of the most haunted locations anywhere and you will enjoy the ghostly activity that is constantly going on there. Shadows have been seen closing doors, noises galore, orbs with the naked eye, interactive EVP and even full-bodied apparitions with detailed clothing have been seen. This is a very exciting investigation that you will NOT want to miss! This investigation will last until the sun comes up on Sunday morning. Of course you will not have to stay all night but if you do, you will be glad you did! We will be having a farewell brunch with the celebrities and the Gold V.I.P. ticket holders! This will be a great chance to get the celebrity opinion on the recreation building and the investigation from the previous night. We think that this will be a very interesting way to end the event and give everyone a very relaxed atmosphere in which they can discuss all that happened the night before! IF YOU ARE FLYING TO THE EVENT, WHICH AIRPORT SHOULD YOU FLY INTO? - This is the BEST choice! You will have to rent a car to drive to Virginia. - It is 56 miles (1 hour drive) from this airport to Virginia. - This is also a great choice! You will have to rent a car to drive to Virginia. - It is 200 miles (3 hours, 17 minutes drive) from this airport to Virginia. WHERE IN THE WORLD IS VIRGINIA, MINNESOTA? For the first time on the “West Coast”, “NPI & NorCal Ghost Talk Paranormal Radio”, brings you a collection of some of the finest, most knowledgable members of the paranormal community. Join us as we Unearth the Unknown in Beautifully Haunted Monterey, California this July! The event will include two ghost investigations (third to be announced) with all the celebrity guests, a couple from Ghost Hunters & Ghost Hunters International! ARGFest-O-Con is a community organized gathering of players, designers, and cross-media enthusiasts that has grown from it’s humble origins of a few friends wanting to get together for beers in Las Vegas back in 2002 into today’s full blown conference attracting many of the leaders and innovators in the field of Alternate Reality Gaming. Our keynote speaker will be Jordan Weisman. We are looking to make this event as unique as possible. There will be general sessions in which our guests of honor will be able to present their thoughts, experiences and opinions on the paranormal as well as small breakout sessions where you will be able to talk with others concerning a wide range of topics concerning the paranormal. We are very excited about the prospect of this convention and hope this will become an annual tradition for anyone interested in the paranormal. It is a great pleasure to invite Supernatural fans from around the globe to attend this very special weekend of entertainment. Taking place in one of the world’s loveliest cities which is also the home to the series production, we are planning the biggest and best Supernatural Convention ever! Make your plans early to be with us for the fun and thanks as always for your continuing support. The Scare Fest is the Largest Horror and Paranormal Convention in the southeast. Come and meet your favorite celebrities in the horror and paranormal community. Over 100 Vendors, Special Media Showing, and Seminars with the Stars will Highlight the event! This years celebrities include Ken Foree (Dawn of the Dead), Douglas Bradley (Pinhead - Hellraiser Series), Gunar Hansen (Leatherface - The Texas Chainsaw Massacre) and MANY MORE! If you are interested in UFOs, ETs, Reptoids, Earth Changes, Crash Retrievals, Chem-Trails and Conspiracies, the 10th Annual Bay Area UFO Expo will guarantee an entertaining and educational experience! The First Annual Las Vegas KillerCon will take place September 17 through 20 at the Palace Station Hotel/Casino in Sin City. The Horror, Thriller, and Paranormal Romance genres collide in this inaugural multi-genre writer’s convention. This event will feature panel discussions, readings, writing contests, parties, book signings, and author Q&As with guests of honor Joe R. Lansdale, Brian Keene, L.A. Banks, Heather Graham, and Edward Lee, as well as many other top talents in Fear Fiction. You’ve seen them on TV shows such as A&E’s Paranormal State, the Sci-Fi Investigates series and the Travel Channel’s Creepy Cryptids...you’ve read about their up close and personal encounters with Mothman....now meet them and ask them questions face to face. Horrorfind Weekend, a giant horror convention. This one of a kind horror halloween and spooky convention features horror movie celebrities, horror writers, halloween seminars and supernatural speakers as well as a giant dealers room , horror movies and many special events. More that just a horror convention, it’s the Spookiest Show on Earth. TrickConTreat is a fan-run convention dedicated to Halloween and the modern culture which has grown up around the holiday. In keeping with our 2009 theme, Things That Go Bump In The Night, we’ll have hours of programming dedicated to ghosts, hauntings, creepy creatures, and the films, books, music, and costumes which make Halloween such a spooky time of year. Our featured guest for 2009 is artist Alain Viesca. (alainvarts.com) We will also be hosting John Ferguson (Count Gregore), Bill Allen, Steven Wedel, Bev Hale, Craig Wolf, Brad Sinor, Dennis McDonald, Brian Young (Dr. Fear II), and many more of our ghoulish friends. Four day film festival and expo focusing on the horror, science fiction and suspense genres. Film screenings, celebrity guests, vendors, workshops, seminars and awards for best projects. Are you INFECTED? YOU WILL BE. We will infect you and once infected there is no cure... or is there? Zombie Con X is a two day horror film convention taking place in Milwaukee Wisconsin! We will be bringing you film stars both classic and new, authors, artist, a ton of contests and give aways and we can\'t forget the ZOMBIES!! We will be bringing you the Zombie Dolls, the hottest monster stomping team ever! Independent films will be shown! Zombie Con X will also salute our military! Come out and join us for a new take on horror conventions! GameX (Games & Media Expo), scheduled October 23-25, 2009 at the Greater Philadelphia Expo Center, is a national game consumer show and “pop culture” festival produced by Virtual Rush Gaming and NBC Universal, designed to draw from national, regional and local audiences of game players, film and TV fans, comic book buffs and tech enthusiasts. High-value consumer content is being provided by exhibitors and sponsors, including major media and entertainment companies seeking to build their brands with the core games audience. See JENSEN ACKLES and JARED PADALECKI from Supernatural LIVE and IN PERSON! Sunday at the convention, alone and together! The conference is hosted by Appalachian author and folklorist Scott Nicholson, with presentations and ghost hunts by Paranormal Scene Investigators, Deborah Leblanc, Jonathan Watts, and more TBA. Run by the Philadelphia Science Fiction Society (PSFS), the convention features a mixture of literary, science, gaming, film, anime, and costuming programming. There is usually an open Meet the Authors/Artists Party on Friday and a Masquerade on Saturday, as well as programming on literature, art, costuming, and gaming panels, an art show, a dealers’ room, and movies. Paranormal Investigators Convention of Chattanooga: The purpose for this conference is to further expand the understanding of paranormal investigations and experiences. Come to the International UFO Congress Convention & Film Festival. With 7 Days & 8 Nights of Activities you will not be bored! Come listen to 30 Speakers from around the world talk about their research in UFOs and the Paranormal. At night be sure to enjoy the Film Festival Screenings or listen and share stories with other people in the Experiencer Sessions. The Madison Horror Film Festival features independent short and feature films in the horror genre, special guets, vendors and more! The VERY BEST paranormal Convention to hit Southeast Texas! Come join the Texas Society of Paranormal Investigators and Lone Star Spirits as they present guest speakers from Ghost Hunters (SiFi network), Monster Quest (History Channel) and many many more. Seven East Coast Paranormal Teams have bonded together to put on an amazing conference. We are proud to announce the Eastern Paranormal Investigators Co-Op Conference: E.P.I.C Con. A-list Speakers: Rosemary Ellen Guiley; John Zaffis; Mark Nesbit; Carmen Reed; Steven LaChance; Bishop James Long; Bill Bean; Willie &lqduo;Windwalker” Gibson; Kelly Weaver; Al Chewning; Belinda Nash; Pam Kinny. Special Events: The Paranormal Alliance headed my George Mathis will be presenting a much talked about concept of Paranormal Unit; Friday night will be our DEAD MAN’S PARTY. The party is open to the public, and we encourage the attendees to come in Haunting Attire. Be that of a ghost, the undead, a ghost hunter or who you were in a previous life. S.O.U.L.S. FEST will be the very first paranormal convention in Southeast Texas. S.O.U.L.S. Paranormal is excited to bring to you guest speakers from across the country and even internationally. These include Doug Carnahan & Shane Thornton from Norcal Paranormal and Norcal Ghost Talk Radio, Rob Henry of West Virginia Paranormal, Shannon Sylvia from Ghost Hunters International and Paranormal State, and also Barry Fitzgerald also of Ghost Hunters International. This Event will present a view from the most renown paranormal investigators , haunted survivors, authors and will keep you on the edge of your seat. From the most skeptic to the most seasoned ghost hunter... there will be something for everyone! So come to our awesome first annual event and meet and greet legendary Ghost Hunters, renown Paranormal Speakers, authors and much much more! in the paranormal community! Keith Age Plays host to one exciting Paranomal shindig each year. Take any Great ghost Photos Lately? Take the Haunts of Owensboro, Kentucky Ghost Tour, and you just might change your mind!